Celebrities from this year’s series, including Simon Webbe from Blue and Radio 1’s Scott Mills, will join Thom Evans, Caroline Flack, Mark Wright and Alison Hammond on the Glasgow leg of the TV show’s UK tour. Completing the line-up is Strictly favourite Zoe Ball, who will host the tour. Dust off your sequins and join in as the stars of the ballroom dance away the winter blues with jiving judges and dazzling professionals. 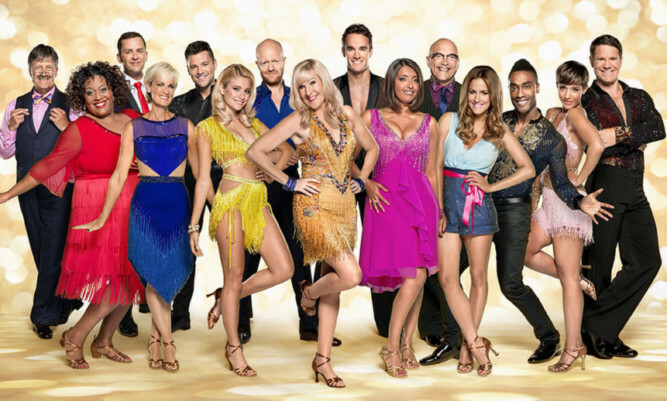 Featuring much-loved routines from this series, together with new and exclusive ones, breathtaking costumes and supersized glitterballs, this multi-million pound UK tour is a must for Strictly fans. So waltz your way to the box office and get your hands on the hottest ticket in town! Direct from four sold-out seasons in London’s Hyde Park Winter Wonderland and its sold-out 2014 theatre tour don’t miss Britain’s favourite circus. Combining contemporary “cirque” skills with thrilling stunt action, it promises a danger-filled spectacle that will amaze audiences of all ages, including the legendary Globe of Death, (three motorcyclists speeding around inside a steel cage at over 60mph), plus a troupe of over thirty jugglers, acrobats, aerialists, dancers, musicians and death-defying stunt men joined award-winning clown, Tweedy. And that’s exactly what we are given in this riotous action comedy which tells of a super-secret organization that recruits an unrefined but promising street kid (newcomer Taron Egerton) into their ultra-competitive training program just as a global threat emerges from a twisted tech genius (Samuel L Jackson). Wonderful memories of Frank Sinatra, Dean Martin & Sammy Davis Junior are promised in this fabulous production that continues to be successful all over the world. The great news is – it’s all totally live and every song is an absolute classic – Come Fly With Me, Under My Skin, Mr Bojangles, Lady Is A Tramp, That’s Amore, Mack The Knife plus many more of your favourites. With an abundance of class & style they take you on a trip back in time to vintage Las Vegas; hip, cool and with their timeless soiree that still remains the hottest party around. Strap yourself in for a Craig Hill thrill! Hot on the heels of last year’s hysterically funny, sold out national tour, don’t miss the chance to see Scotland’s favourite kilted treasure live and unleashed. Dubbed a deliciously wicked evening of gloriously camp no-holds-barred comedy and pure, unadulterated fun, this show, which has attracted rave reviews, is certainly worth a watch. An evening in the company of top Elvis impersonator Lee ‘Memphis’ King, performing a selection of Presley’s hip-shaking greatest hits. Lee saw one of Elvis’s films ‘Roustabout’ when he was only a few years old and has loved the man and his music from that day on. Even as a child he found himself imitating Elvis’s voice and as he grew up this became an overwhelming obsession to perfect Elvis’s voice and to recreate the excitement and passion that Elvis himself put into every performance. This promises a great night for any fan of The King, with tracks such as Hound Dog, Jailhouse Rock and The Wonder of You guaranteed to leave you All Shook Up. From the producers that brought Broadway! A Musical Celebration to Dundee comes Broadway! A Night at the Movies. Featuring a show-stopping cast of dancers, West End singers, unforgettable songs, dazzling choreography and tributes to some of your favourite movie musicals. The performance includes songs from hit movies such as Dirty Dancing, Footloose, Mamma Mia, Blues Brothers, Oliver!, Annie, The Rocky Horror Picture Show, Fame, Singin in the Rain, My Fair Lady and many more. Guaranteed to put a smile on your face and have you singing and dancing into the night. Treat yourself to a night at the opera with Mozart’s great works in a semi-staged performance by the Royal Conservatoire of Scotland. The Marriage of Figaro is a sparkling comedy with seething tensions just below the surface. The aristocratic count and his servant Figaro pit their wits against each other aided and abetted by the Countess and Susanna. The opera contains some of Mozart’s best loved melodies and the dramatic pace is such that three hours pass in the blink of an eye. Don’t get confused by the title and think you’ve missed the other five movies in the series. This Oscar-nominated Disney animation is inspired by the Marvel Comics superhero team of the same name (of which there are six members). Robotics prodigy Hiro (voiced by Ryan Potter) lives in the city of San Fransokyo. Besides his older brother, Tadashi, Hiro’s closest companion is Baymax, a robot whose sole purpose is to take care of people. When a devastating turn of events throws Hiro into the middle of a dangerous plot, he transforms Baymax and his robotic friends into a band of high-tech heroes. Ewan McGregor looks right at home as the tough guy in this gritty all-action flick. McGregor plays a heavily-tattooed jailed criminal who teams up with new arrival JR to break out of prison and plan a heist.